As the World Trade Center was on its way up in the 1970’s a neighborhood plumber working the Sunday shift asked if wanted to accompany him to the top of the world. He knew I loved taking pictures. It was crisp that early morning and increasingly colder as we rode the construction elevator to the 98th floor. A harsh wind blew in from the west which made my footing unsteady. I was scared but the thrill overrode the fright. I was on top of the world. At that point in time, the Twin Towers had no skin; they were hardly twins yet. They were skeletons, a gigantic erector set. Multiple construction elevators throughout the structure as well as strapped to the exterior of the two monoliths brought a massive array of construction materials to their destination on each floor. We were in the North Tower, as high as the 104th floor. The sights and piercing sounds were stunning. Looking down at the South Tower it seemed small at what was then sixty-plus stories. The Hudson River had a new shoreline, created with massive amounts of excavated material removed to make space for the WTC foundations, complex transit system and shops to be built below ground level. Multiple parts of the island’s history had been dug up, enabling the basis for new chapters; what would become Battery Park City and TheWorld Financial Center. Big ideas and big money had come to roost in lower Manhattan. I was an inexperienced photographer, clutching my camera doing what I could in the penetrating wind and cold. 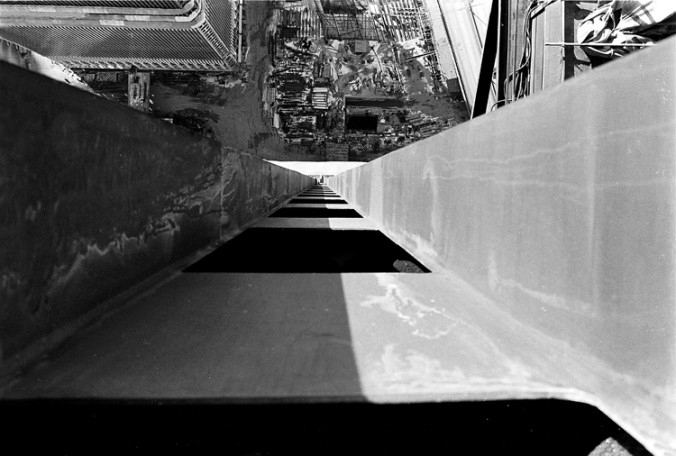 For what may be my favorite photo, my friend Walter held my feet as I lay on the barren cement floor so I could lean over the edge and shoot straight down between the beams that would eventually border the windows running up to the top. It was one of too few pictures I took that day. On September 11, 2001, I was alone in our home and photo studio on Franklin Street in Tribeca. It was a crisp beautiful day. Our son Kyle had walked the few blocks to PS234. My wife Anne was in-flight home from a business trip to Chicago There was lots of construction in the area. We lived in New York’s boomtown. There was frequently noise and constant dust in the air. The radio was on. “We interrupt programming for this special report”. Our family, a speck in the vast scheme of things, weathered the events as best we could. Anne’s flight was diverted to Buffalo for the following few days where she was unable to do a thing; her nerves were shattered. Unable to get news of her whereabouts, the downed plane in Pennsylvania prompted a mass of emotions you may only imagine. PS 234 sat on the corner of Chambers and Greenwich Streets, Kyle’s classroom facing south viewing the towers. Franklin Street was eight or nine blocks from the attack; Kyle’s classroom a mere three. School officials did what they could to organize a speedy exit for the children. The towers hadn’t fallen; who suspected they would? Some children made their way out with their parents, others with the parents of a friend or school officials. There were no cellphones. I hurried to find Kyle and truly, as luck prevailed, we discovered each other on Greenwich Street. Anne watched the scorched South Tower fall on television in the Buffalo International Airport. She suffered alone in the midst of strangers. Our ability to communicate was finally made possible triangulating calls with her sister in Illinois, who was able to speak with us individually and convey the status. Kyle and I, along with the throng on Greenwich Street, watched a tower fall before our very eyes. Surely, these words don’t match the scene. 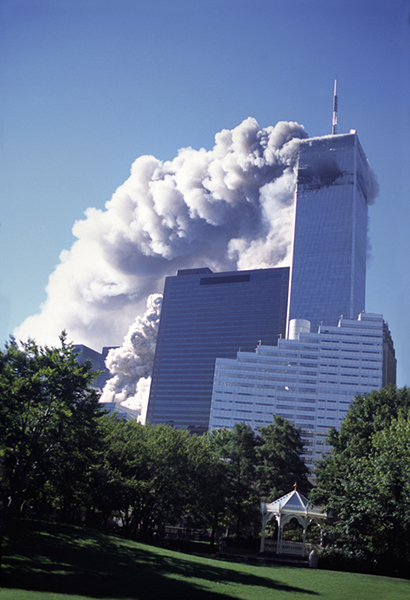 Each tower collapsed straight down onto itself in ever-rising billows. Westerly winds which took my breath away on The North Tower years before now carried massive amounts of smoke, debris and all else, blowing it steadily toward Brooklyn. Much of the area just a few blocks north of the towers, including our block, was spared the awful resultant thick gray carpet of horrors. The days that followed were a combination of bedlam, indescribable courage, mammoth effort, anger and misery. For many months, hundreds of flatbed trucks passed by, carrying charred and twisted remains on their way to a site where the debris would eventually be sorted and analyzed. On one such day a truck stopped at a light on Church Street, presenting the opportunity to photograph a tortured relic from its precious cargo. There were many photographers and videographers whose work documented that day and the years and tears since. A few of my pictures are in the permanent collection memorializing those who perished.